Nostalgia is powerful in the world of gaming, especially on the Nintendo Switch with games like Shovel Knight and Celeste hitting that 8-bit and 16-bit era exceptionally well. However, we haven’t really seen any titles embrace gaming before the NES and SNES were household names. ROCK BOSHERS DX: Director’s Cut, from developer Tikipod Limited, is looking to buck that trend with nostalgia that goes back even further with fantastic authenticity to early 80’s gaming with the ZX Spectrum console. The story takes place in a steampunk version of Victorian London where humanity has recently traveled to Mars and begun colonizing it. You play as young Queen Victoria (yes, the actual historical Queen Victory) who has grown tired of her Royal life and venture aboard a shuttle to Mars. Unfortunately, she quickly discovers that everyone on the planet has been working for Martians as slaves and now she is tasked with freeing fellow workers and escape the red planet. ROCK BOSHERS DX: Director’s Cut does not take itself seriously, and I love it for doing that. When you first start, you’ll learn that there are three pickups to collect for each level: a cup of tea, cheese, and a jam scone. These items act as collectables and work towards gaining 100% completion in each level. However, you will also need to beat the best time in order to gain the highest score. This is difficult to achieve on your first playthrough, but you are able to go back to select each stage you’ve completed in order to try and best your previous score. ROCK BOSHERS DX is a twin-stick shooter with your default weapon having unlimited ammunition with an average rate of fire. Further along on the adventure, you’ll be able to pick up additional weapons, from a machine gun and uzi, to a coal rocket launcher and laser gun. You can easily select these new weapons using the right and left shoulder buttons, however, unlike the default pistol, your additional weapons have limited ammo. Don’t let that hold you back from using them though, because you just lose them at the end of each stage anyway. Some stages have simple puzzles you may need to solve which usually involve destroying terminals or finding colored keys to unlock certain gates. Each level ends when you finally reach an elevator that will take you up to the next level. The first area mainly acts as a tutorial introducing different enemy types, turrets, keys, and weapons. Fortunately, this never felt forced and despite its simplicity, the new gameplay elements were introduced in an organic way. The old school difficulty is present in ROCK BOSHERS DX: Director’s Cut, but you do start out with five hit points in the form of hearts. Much like the collectables, there are also various health pickups throughout each level. On your travels, you’ll also encounter friend NPC’s such as other laborers and these workers will eventually fight back against the guards. Gameplay changes come in the form of taking control of turrets or even tanks. The tank in particular, is incredibility satisfying to control and lay carnage down on the enemies. Unfortunately, this lasts only about two levels before the tank runs out of steam, but it’s another fun inclusion. Once you are done with the story, ROCK BOSHERS DX: also contains four arcade style games and these can only be unlocked by collecting the prerequisite number of tea, cheese, and scones lying about. The humor is still present in these modes, presenting some over-the-top and highly amusing scenarios. For example, in one mode you’ll play as Queen Victoria’s cat traveling to an alternate reality and protect a deep-sea milk drilling platform. Overall, the developers over at Tikipod did an outstanding job of creating an experience that feels right at home on the ZX Spectrum or Commodore 64, faults and all. Everything is charmingly simplistic, even going so far as to have the colors overlapping one another. The soundtrack is also great with its chiptunes sensibilities and authentic to the era. 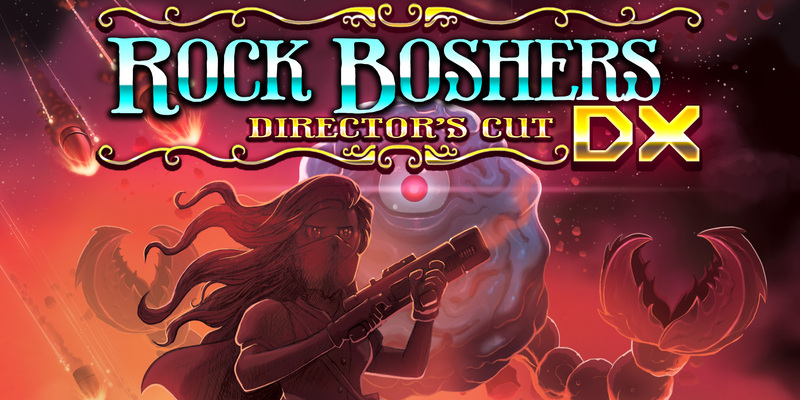 ROCK BOSHERS DX: Director’s Cut comes recommended to those who appreciate a love letter to a simpler era of gaming.